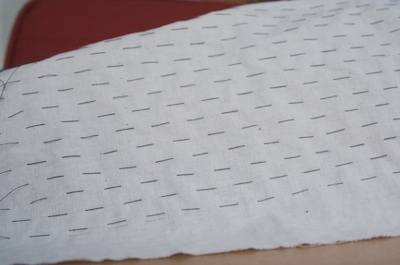 In response to Shiborigirl‘s challenge to try to figure out or replicate this pattern, I decided to start simple. Rows spaced half an inch apart, half inch stitches, off set each row by half an inch. I knew looking at the original fabric this wouldn’t get the same pattern- but it could be a jumping off point. About 3/4 of the way down the fabric- trying to sketch the stitch lines and lining up quilting rulers to make sure the off set was correct (and frequently winding up with wonky lines) it occurred to me that drawing an actual grid would have been a helluva lot easier. So would have been doing this without trying to watch Deadliest Catch at the same time. Clearly, not what it was supposed to be. I need better thread. I’ve been using nylon coats and clark thread for the silk tying. But it is not thick enough for using with this fabric I don’t think. Or maybe I just need something less slippery. I had a hard time tying the threads tight enough to get clear resist. 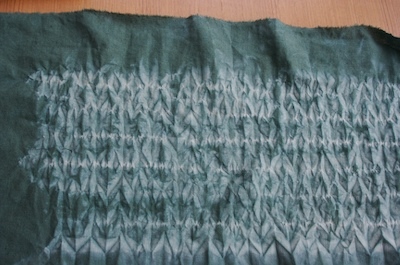 In digging through a box of samples that I’d done, I realized I had tried this technique a few years ago- before I really started getting into dyeing. I had used a heavier weight “thread of unknown origin” that had been in my grandmothers stash of sewing/craft supplies. It was the perfect weight for that- there were threads still in there, and I remember the cone it was on. I also remember chucking it when the basement flooded 2 years ago. I think I over swished (agitated) in the dye bath. Not entirely sure that original fabric did get immersed. Not even sure it was mokume. So I will think about this some more and try again on the weekend, after I get the veggies in the garden. And I will chuck that green dye stock, it seems shot anyways, and it’s a really icky color. 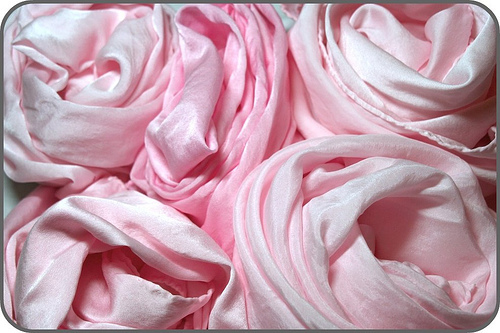 So I spent the better part of yesterday early a.m. putting 5 velvet, 5 charmeuse, and a couple of crepe de chine scarves in their various dyebaths. The silks were all in acid dye baths, small containers, and nuked for at high for 4 minutes, one minute intervals, then left in their closed containers, steaming happily for the next hour until I was ready to rinse. I used some older dyestocks that couldn’t really be used for alkaline processing, as I had read you can still use them, even if they’ve been sitting on the shelf a while. I had just used these the day before with not problem. The velvets were also lwi, but alkaline processing, sitting in their containers. Fresh dyestocks. I don’t know if it was the temperatures, wrong PH, or a combination, but the Blue in everything seems to be washing out. I’m guessing temps and not enough time. I got impatient and started rinsing after 3 hours. Actually no “seems” about it. 3 Silks were a beautiful mottled deep teal (less pronounced patterning intentional) I wanted to then pole wrap and discharge. They are now the palest sage green. 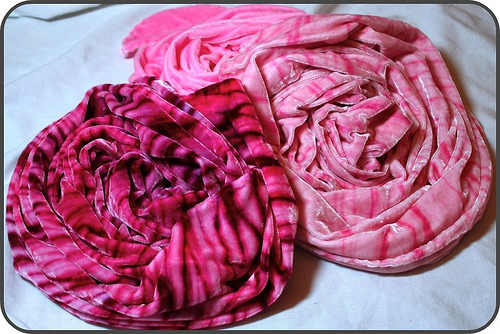 The gorgeous plum scarves are on the violet side of fuschia. Kind of “barbie” fuschia. The browns are less gorgeous and the mottles have a more pronounced fuschia and yellow lines. Not the deep earthy variations they were. I have been hot washing (after they all had preliminary rinses in cold water) all yesterday and today, and I still have “muddy water”. Hopefully I can overdye the velvets. The silks are practically white so i know I can do those again. I guess the “fun with shibori” will have to wait till tomorrow.